When we discovered how good Manchego cheese is, after eating it in a squash and tomato casserole the other night, we couldn’t wait to have it again…. 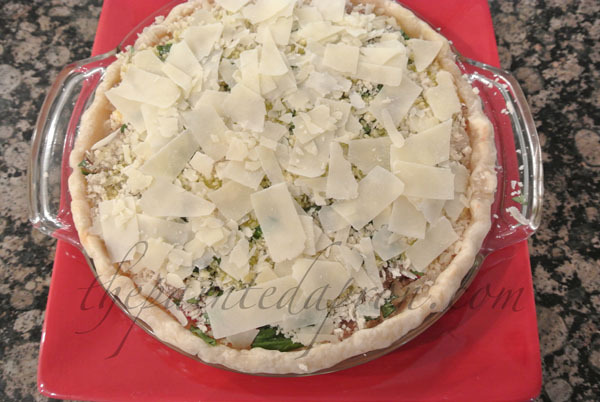 HHjr decided to try it in a summer tomato pie, and he hit another home run with this version. 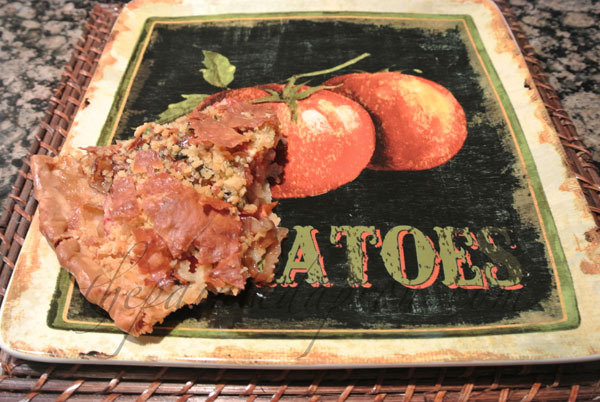 He based his recipe on Emeril’s Cheesy Vidalia Onion and Tomato Pie, from the Food Network. It was so cheesy, sweet oniony, tomatoey, crunchy, and creamy, all at the same time, GOOD! Slice the tomatoes, discarding the stem and root ends, into 1/4-inch slices and lay out on paper towels. Sprinkle with salt and let drain for 15 minutes. Pat try and season again with salt and pepper. Saute onion in 1 Tablespoon each of olive oil and butter. Cook and stir over medium until starting to brown and caramelize. Separate egg, reserving yolk. 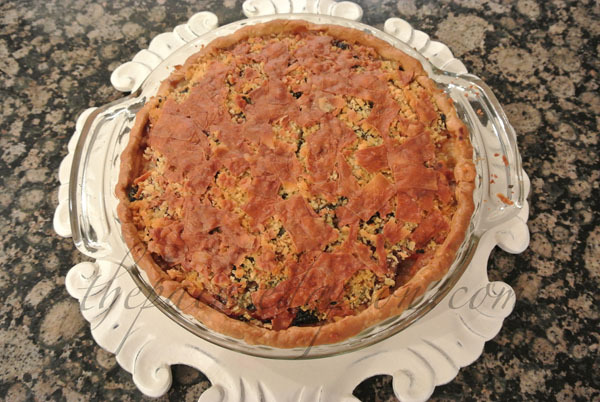 Brush the pie crust with egg white and let dry. 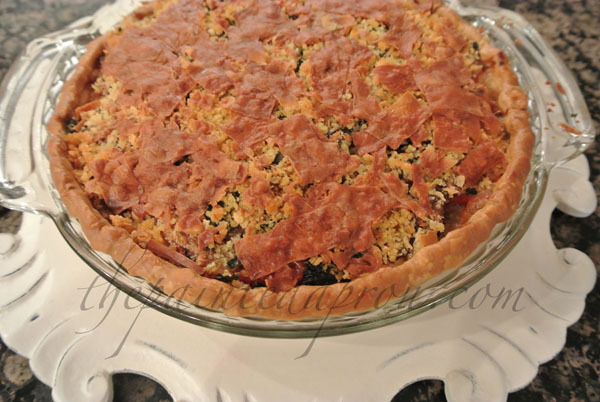 Sprinkle about 1/3 of the bread crumbs in the bottom of the pie crust. In a small bowl combine the mayonnaise with the reserved egg yolk and stir until smooth. 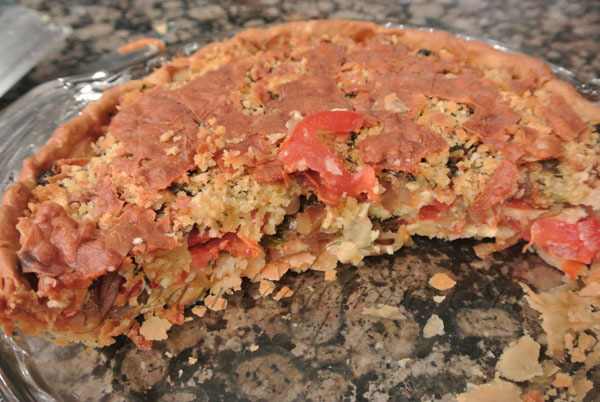 Place a layer of tomatoes in the bottom of the pie crust over the breadcrumbs, using about half of the tomatoes, then top with half of the onions. 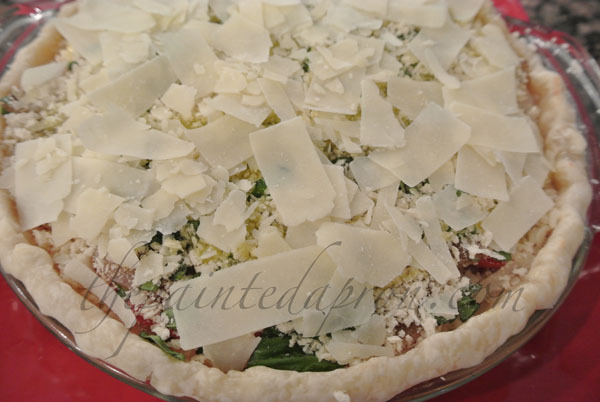 Sprinkle with half of basil, half of the Manchego and half of the Parmesan cheeses. Drizzle with 1/2 of the mayonnaise-egg mixture. Repeat. Top with remaining 1/3 of breadcrumbs and drizzle with 1 T olive oil and sprinkle with the additional 2 T of Parmesan. Sigh……. I sure am going to miss all these summer vegetables, can you believe fall is just around the corner? ~ Thanks so much for joining me today! Tell HHJr it looks fantastic and I love the little scratch on the couch. LOL. Thank you for sharing it on our BBQ Block Party. Yum, I can taste this now! 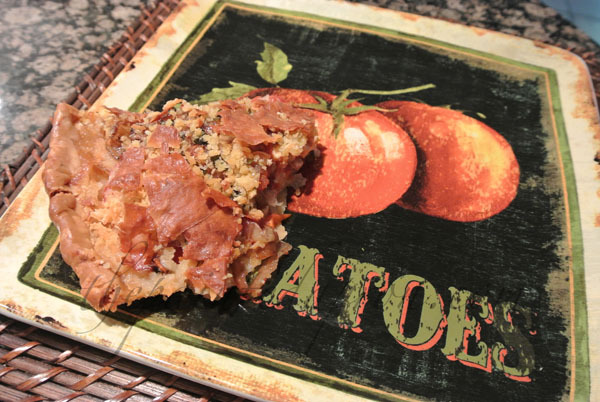 When I saw that it has manchego cheese, this recipe was an instant winner. I’m thinking this would be great as an appetizer or as dinner with a salad.